Now and Then – Blends of old and their Contemporary Counterparts. The Past and The Present – A crystal ball for the future? Bacon sandwiches and a good coffee were just the aperitif for a hard-days drinking, or rather sampling. Sampling of eight old blends alongside their current siblings. Siblings is a good analogy; family similarities could be seen… but the differences were, in some cases, vast. The ‘Now & Then’ had their inaugural get together in Edinburgh. Why the ‘Now & Then’? We meet now & then, every three months or so and we compare/contrast whisky from now and then. David doing what he does best. Andy clearly disliking something. Guess what? This isn’t going to be a traditional write up of tasting notes, it’s going to be a little more focussed on the stats. While we took detailed notes, RW101’s modus operandi is to use data to drive our insight and intelligence. The numbers don’t lie so we’re more or less going to stick with them. Blends are where it all started for Scotch whisky as a ‘proper’ industry so blends were where we started. The biggest whisky companies in the world are primarily blenders and the biggest selling Scotch whiskies (by millions of cases) in the world are blends. Love them or loathe them, without blends we would be without Scotch as we know it today. Worthy of note; all but one of these bottles bore no age statement in both old and new guise. Chivas 12 year old was the only whisky with an age statement. Clearly the expectation for malts is very different and we’ll certainly cover that old chestnut another time. Each old whisky was carefully chosen to be the closest ‘dead’ relative of its current bottle so we could accurately compare apples with apples. Having old and new for exactly the same variant meant we could also review product changes, ‘flavour-drift’ (as Charles so eloquently says) or, in some cases, product zig zag! 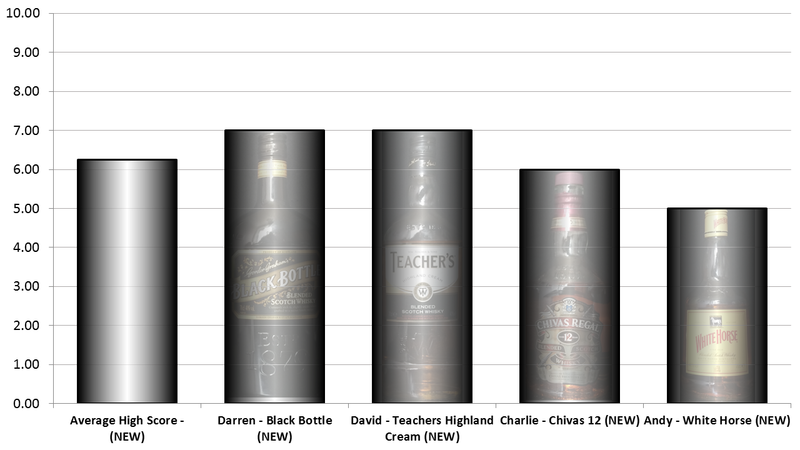 The most striking thing is, without exception, the top eight positions are occupied by the older bottles – Not one of the modern-day variants made it into the top 50%. There’s even a notable drop from the lowest scoring old whisky (Ballantines) to the highest scoring new whisky (Chivas 12). Ballantines also displayed the most consistent profile between old and new; there were very clear similarities. What we thought of the top two and the bottom two. Ranked 1 out of 16: Chivas 12 (old) was described as – Sweet, Complex and interesting with good texture, lightly woody and a hint of smoke. Ranked 2 out of 16: Johnnie Walker Red Label (old) – Rich, parsnips, artichoke (waxy), tinned tomatoes, hessian, light sweetness then dry, old fashioned. Ranked 15 out of 16: Grants Family Reserve (new) was described as – Thin, young, grainy, chemical and bitter. Ranked 16 out of 16: Whyte & MacKay Special (new) was described as – Sweet and mild. Grainy (acetone), hot – a surprise. Fades to nothing. When both old and new scores are combined, the overall best scoring brand is Chivas, taking 51 points out of a maximum 80 and just four points ahead of second place Johnnie Walker Red Label. Third place went to Grants who were 1.5 points behind Johnnie Walker. 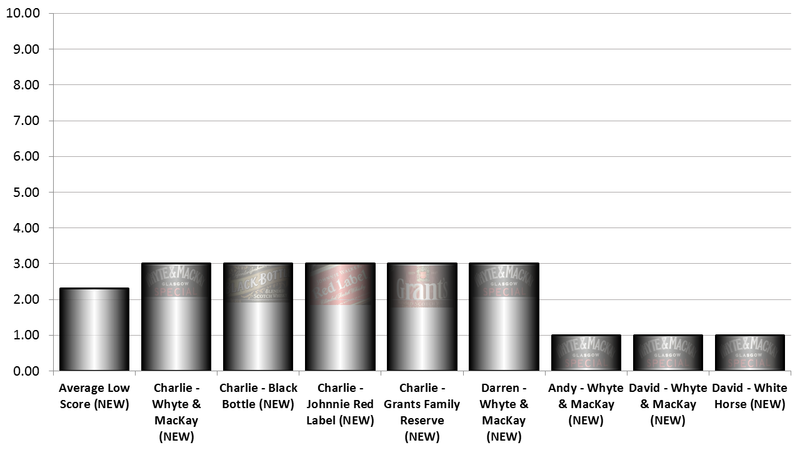 The lowest overall brand score was Whyte and MacKay who achieved 31 points, largely down to the very low score achieved by the modern day bottling. A matter of personal taste? It has to be. …But the broad similarity in preference is more than a coincidence. There are clear winners. 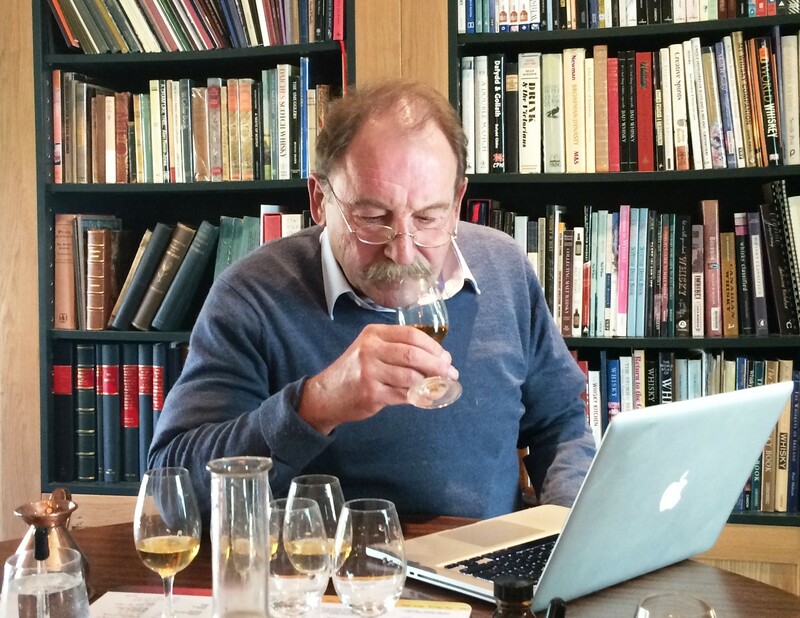 Joint high scores are recorded where someone ranked two or more whiskies as their top score. 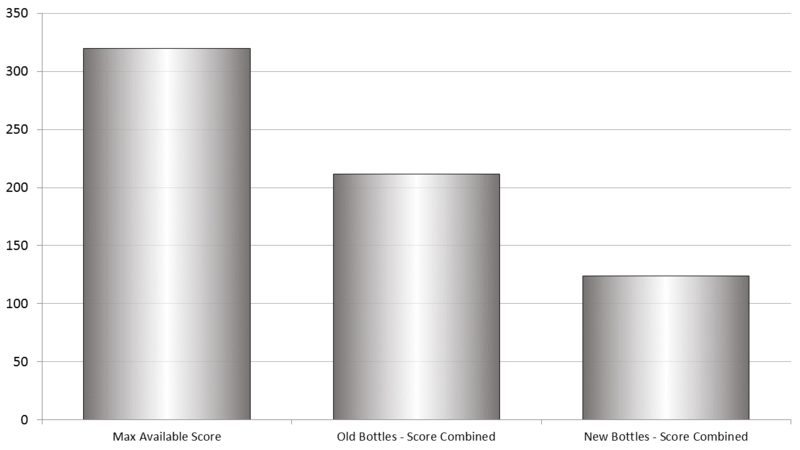 The Average of the personal high-scores for the old bottles was 8.3 out of 10. The old bottles had some very clear winners. The only perfect 10 was awarded to Johnnie Walker Red Label by David, a nose more used to malt than blend…he obviously loved something in this old JWR. 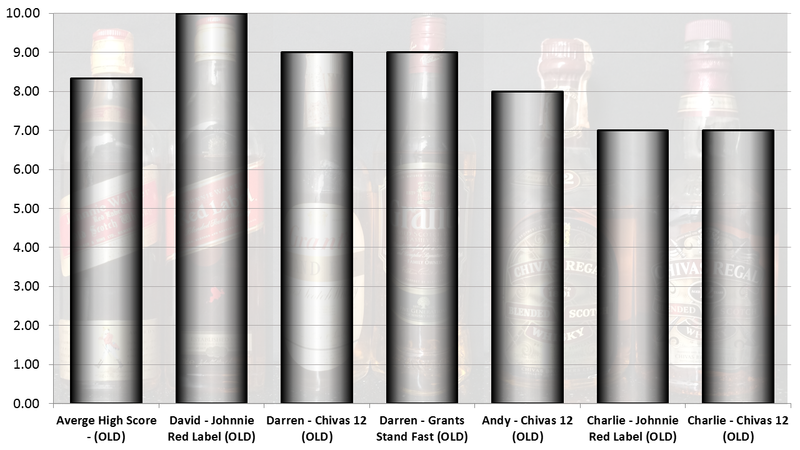 Chivas 12 took the day with three top scores, closely followed by Johnnie Red with two top scores. Grants Stand Fast took a respectable third place. Almost everyone had the same top three. The most lavish in awarding his points was David, the hardest nose to please was Charles. 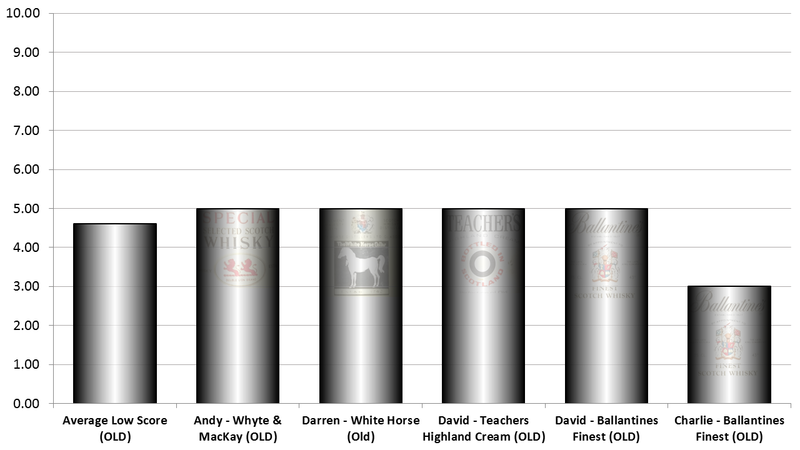 The most consistently scored old bottle (the bottle with the least variation of scores) was Whyte & MacKay. It scored a consistent six other than myself, and I scored it five. The most divisive old bottle was Ballantines finest where Charles scored it three and Darren scored it eight (David scored five and I scored six). The average of the personal high-scores for the contemporary bottles was 6.25. 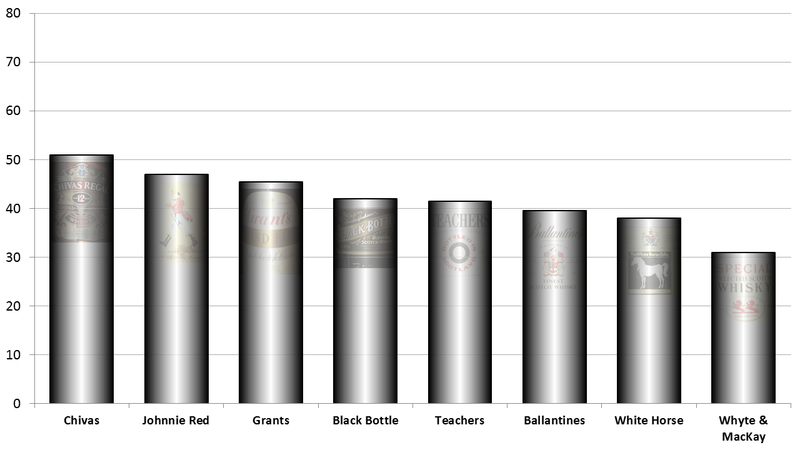 Black Bottle and Teachers took the joint highest personal scores and were the only current bottles to score 7 or more. One of the largest polarities in score was my White Horse score of 5, David scored it just 1 with notes saying it was exceptionally bitter. Ranked 10 out of 16: Teachers (new) was described as – rice pudding, rubber, dried fruits/Xmas cake mix – European oak. Rich and sweet taste, hint of coal smoke. Ranked 13 out of 16: Black Bottle (new) was described as – light, more acetone, meaty, roast beef crisps, salt. The average for the lowest scoring old bottles was 4.60. With both David and Charles giving it their lowest score, Ballantines Finest was the worst performer of the old bottles. Ranked 8 out of 16: Ballantines Finest (old) was described as – Somewhat closed. Carpet, flour paste; pleasant, some apple tart. Ashy and dusty. 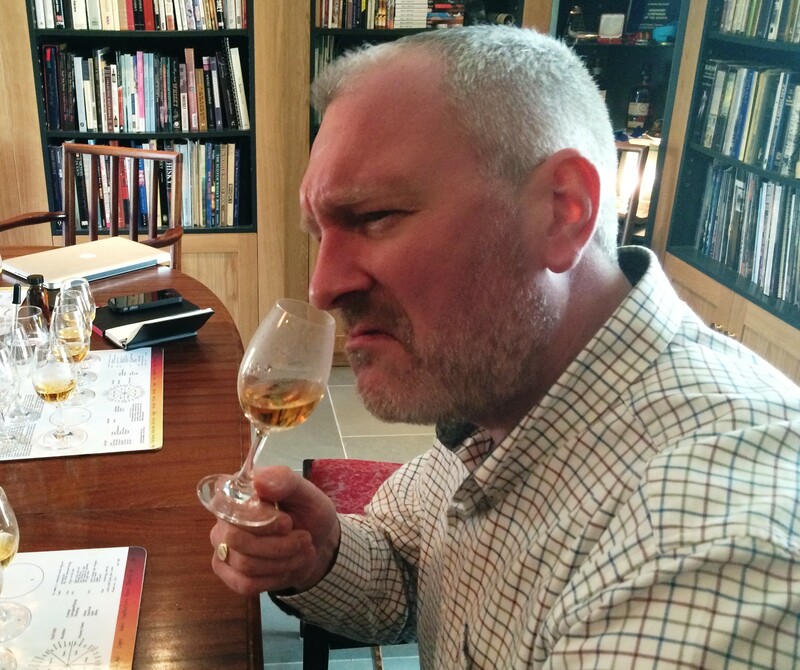 Ranked 7 out of 16: Whyte & MacKay Special (old) was described as – Very mild nose, some face cream. Fresh, fruity, slightly musty, flour paste, somewhat artificial. The average for the lowest personal score for the new bottles was 2.30. Whyte & MacKay received the lowest score from all of us. In some cases it was a joint low score but the commonality was striking. Was there an element of significant batch variation with the Whyte & Mackay? Whatever it was, it was unilaterally scored the lowest. 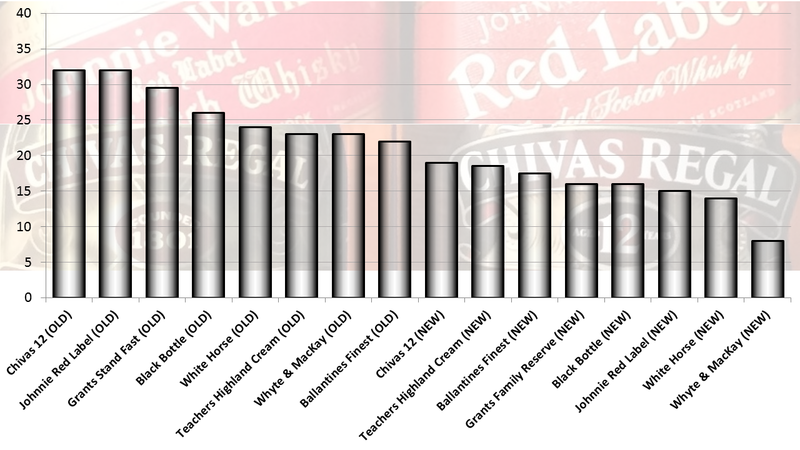 Ranked 14 out of 16: Johnnie Walker Red Label (new) was described as – Deep colour. Deep acetone; colour suggests more. Thin. Grain whisky. Which nose was hardest to please and who was most generous with their points? Andy awarded a total of 76 points. Charles awarded a total of 76.5 points. David awarded a total of 84 points. Darren awarded a total of 99 points. The old bottles took 66% of their total possible points and the new bottles took just 39%. The old bottles in effect scored 70% higher than their modern day contemporary releases. 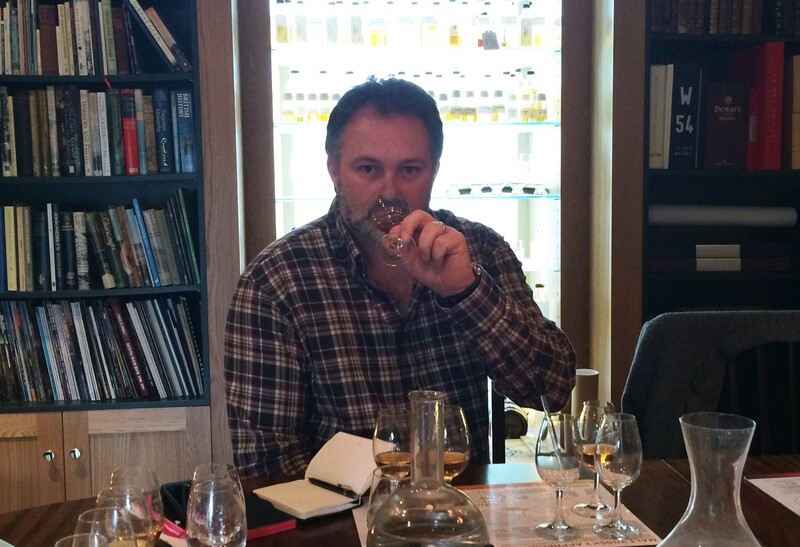 1 – Age – Is the average age of whisky in the old bottles higher (the old age debate comes up again)? Both the malt and the grain components? 2 – Recipe – Higher malt content? 3 – Wood – More sherry influence in the old bottles and less ex BB from USA? 4 – Process – Barley varieties, slower malting, gentler mashing, more complex fermentation, direct fired stills and different cut points? 5 – Bottle ageing – How does the spirit change in the glass over time (to some degree, chemically it must), softening, rounding out and harmonising flavours? All simple hypotheses and none would be easy to prove one way or the other. That said there really is no escaping the significant difference between the big-brand blends of now and then. So what? Where can you go to get these great old blends? Auctions maybe, private collections possibly… And what of the future? Will flavour-drift continue? I shall look forward to doing this again in ten years. The next time we’re together we move onto malts. David’s task, which he’s chosen to accept, is sherry-bombs of now and then. 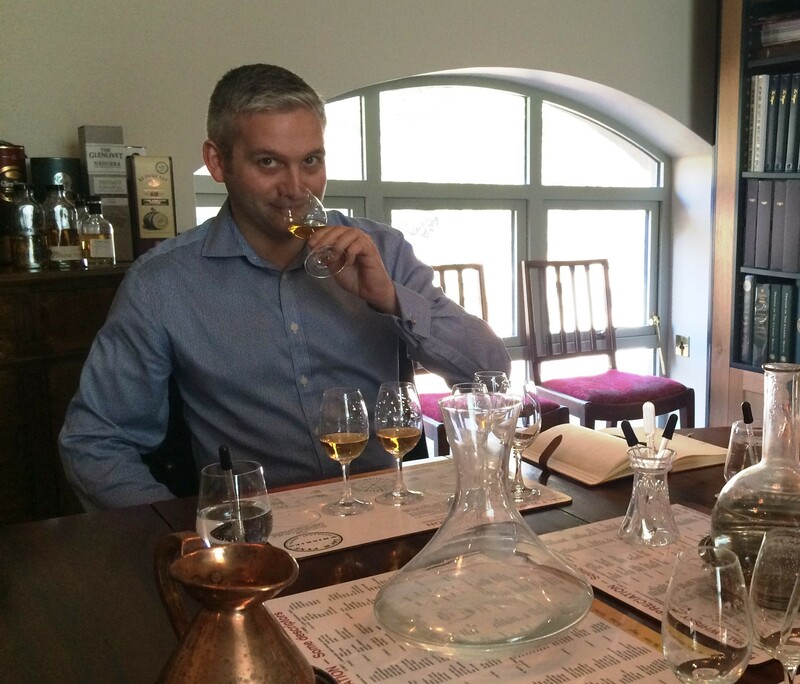 As the ex-Master Distiller from the (past?) king of sherry, The Macallan, it seems a fitting challenge.